It is a historic public house which dates back to 1606 but has undergone significant changes to bring the present structure into the picture. Today it is a pub which hosts rock music too. You will get to see beer garden on the premises too. The selection of drinks is exclusive. You can look forward to spending a nice Friday evening at the pub with great drinks on the menu and lively music to entice you to dance to the tunes. Have burrito with beef, hatchet burger, pork belly bites with your drinks and you will enjoy each bite that you have. To look at the old art and how beautifully it has been crafted into a pub go ahead and have a drink here. College Green (Stop Pb) is the closest bus stop to the place and you can take a bus from there. Bristol Temple Meads station’s trains can be taken to the destination. How popular is Hatchet Inn? 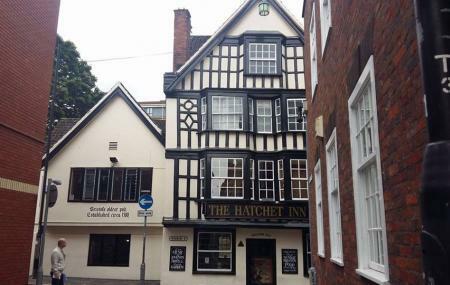 People normally club together St Nicholas Market and Pirate Walks while planning their visit to Hatchet Inn.